In C programming, pointers and array shares a very close relationship. Array is a data structure that hold finite sequential collection of similar type data. We use array to store a collection of similar type data together. To access and array element we use index. These index starts from 0 and goes up to N-1 (where N is size of the array). It declares an integer array with a capacity of five elements. To access any element of the given array we use array index notation. For example to access zeroth element we use arr, similarly to access fifth element we use arr. Let us transform things in the context of pointers. The above statement declares an integer pointer pointing at zeroth array element. In C programming, array exhibits a special behaviour. Whenever you refer an array name directly, is behaves a pointer pointing at zeroth array element. Which means both of the below statements are equivalent. This special behaviour of array allows many interesting things to happen. Things such as you can interchangeably use array and pointers. You can also use array name as a pointer pointing at zeroth element. In context of array and pointer, all of the following statements are valid. In the above image first array element i.e. arr is allocated at memory 0x1000. For the above case I have assumed integer size as 4 bytes. Hence, next array element i.e. 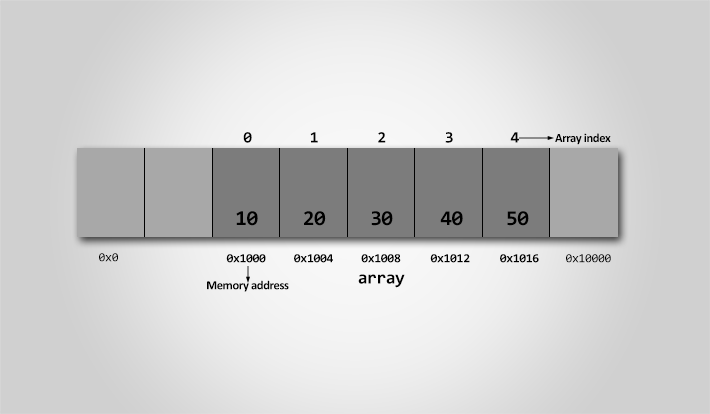 arr will get memory at 0x1004 and so on fifth array element is allocated at 0x1016. Since array elements are stored sequentially, hence you can easily apply pointer arithmetic to iterate though elements. You can use following pointer arithmetic operations to access array elements. *(ptr + 4) = 100;       // Assigns 100 to arr. // Note, ptr currently pointing at arr not arr. The condition while(ptr < &arr[SIZE]) will iterate till ptr points withing array range. In statement scanf("%d", ptr); you might have noticed that, I have not used address of operator & with variable name in scanf() function. This is because scanf() function accepts memory address and pointer variable contains memory address. Hence, there we can use pointer variable directly in scanf(). Is name of array is constant pointer to zeroth array element? As I spoke earlier whenever you use array name directly, the C compiler assumes it as a pointer pointing at zeroth array element. This pointer is not modifiable. Therefore, you may think it as a const pointer. Constant pointer is a special pointer whose value cannot be modified. Means a pointer that once point to a memory location cannot point to another memory location later in the program. Let us write a C program to prove array name behaves as a constant pointer in C.
* arr = arr + 1 which is not permitted. On compilation of the above program, it produces following compilation errors. Which is a proof that the array name (as a pointer) is not modifiable. However, the above proof is not adequate to say array name is a constant pointer to zeroth element of array. If it is a constant pointer then sizeof(arr) must return size of constant integer pointer, but it doesn't. sizeof(arr) returns total bytes occupied by array i.e. number-of-elements * array-data-type-size. Read more about, how to find size of a data type using sizeof() operator. I have read text of many authors, calling name of array as constant pointer to zeroth array element. However, the statement is not true. Array name when used directly behaves as a constant pointer but it is not a constant pointer. Pointer and array both are different concepts though interlinked. The behaviour of array as a pointer lets you do several magical things. Let us discuss another important behaviour of array as a pointer in C programming. Consider the below integer array. We can also write the statement *(arr + 0) as *(0 + arr), since additions are associative in nature. Which in array indexed format can be written as 0[arr]. Let us collect it all together. Conclusion: You can interchangeably use arr as 0[arr]. Both convey the same meaning in C programming.